Add some pizzazz in your calf crop! Herbie has been a standout since birth and with his blaze face, he is an individual that just naturally draws attention to himself. He is really impressive with his extreme muscle and massive rib shape while still being sound as a cat. 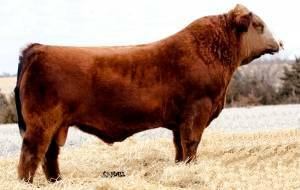 He comes from a royal family going back to the Drake P36D cow that has produced as many champions as any cow in the breed, including some great bulls like the ABS bull Lazy H Pathfinder. His first calves have just hit the ground and this may be his most impressive attribute, as they are coming in very moderate size and to top it off most have a white strip to a blaze on their face and have been all solid colored to this date.